Leeman Kessler takes over the GhostwoodsBooks Twitter account today, April 4 from 1 – 3 EST. 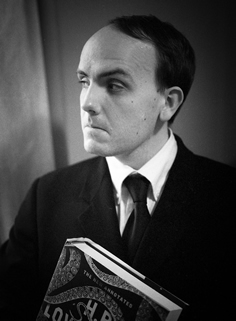 Leeman Kessler is the host of AskLovecraft on YouTube, where he portrays the horror writer H.P. Lovecraft and gives Lovecraftian advice to fans who email him questions. He also does many other creative things, including being a dad. We’ve invited Leeman to talk about what he does and about the ups and downs of being a working creative. Bring your questions and tweet him @GhostwoodsBooks using the hashtag #askleeman! Or just sit back and read.